Learn how to crochet the Andante crochet throw with this free, easy to crochet afghan pattern from Caron Yarns, featuring decorative joined squares. This elegant lacy afghan would look beautiful on your bedspread or laying over your living room couch. While it's striking as a solid colored afghan, you could also use two colors to give it a unique look. This is a more advanced pattern, but is a great challenge for any level of crochet fan! Gauge: Each square = 5 1/2 x 5 1/2"/14 x 14 cm. beg-Cl: Beginning cluster— Yarn over, insert hook in indicated space, yarn over and pull up a loop, yarn over and draw through 2 loops on hook, *yarn over, insert hook in same space, yarn over and pull up a loop, yarn over and draw through 2 loops on hook; repeat from * once more, yarn over and draw through all 4 loops on hook. Cl: Cluster—Yarn over, insert hook in indicated space, yarn over and pull up a loop, yarn over and draw through 2 loops on hook, *yarn over, insert hook in same space, yarn over and pull up a loop, yarn over and draw through 2 loops on hook; repeat from * 2 more times, yarn over and draw through all 5 loops on hook. square-join: Ch 1; holding neighboring square close to work with WS of current square and neighboring square facing each other, *slip st in corresponding ch-3 sp of neighboring square, ch 1. Squares are joined to neighboring squares while working the last round (joining round). In joining round, when working along a side of the square that neighbors another square, work square-join instead of ch-3 for each ch-3 sp (including corners) along the side to join the square to the neighboring square. Throw consists of 80 squares, 15 each of squares 1, 2, 4, and 5, and 10 squares each of squares 3 and 6. Chain 5; join with slip st in first ch to form a ring. Round 1: Ch 4 (counts as dc, ch 1), [dc in ring, ch 1] 7 times; join with slip st in 3rd ch of beg ch. Round 2: Ch 3 (counts as dc here and throughout), 2 dc in same st as join, *2 dc in next ch-1 sp, dc in next dc, 2 dc in next ch-1 sp, 3 dc in next dc; repeat from * 2 more times, 2 dc in next ch-1 sp, dc in next dc, 2 dc in next ch-1 sp; join with slip st in top of beginning ch—32 dc. Round 3: Slip st in next dc, ch 6 (counts as dc, ch 3), dc in same st as join, *[ch 1, sk next dc, dc in next dc] 3 times, ch 1, sk next dc, (dc, ch 3, dc) in next dc; repeat from * 2 more times, [ch 1, sk next dc, dc in next dc] 3 times, ch 1; join with slip st in 3rd ch of beginning ch. Round 4: Ch 3, *5 tr in next ch-3 sp, dc in next dc, [ch 1, dc in next dc] 4 times; repeat from * 2 more times, 5 tr in next ch-3 sp, dc in next dc, [ch 1, dc in next dc] 3 times, ch 1; join with slip st in 3rd ch of beginning ch. Work Round 5 of first square without any joining. Round 5 (joining round): Ch 1, sc in same st as join, ch 3, *sk next 2 tr, (sc, ch 3 or square-join, sc) in next tr (corner made), ch 3 or square-join, sk next 2 tr, sc in next dc, [ch 3 or square-join, sc in next dc] 4 times, ch 3 or square-join; repeat from * 2 more times, sk next 2 tr, (sc, ch 3 or square-join, sc) in next tr (corner made), ch 3 or square-join, sk next 2 tr, sc in next dc, [ch 3 or square-join, sc in next dc] 3 times, ch 3 or square-join; join with slip st in first sc. Fasten off. Chain 6; join with slip st in first ch to form a ring. Round 1: Ch 5 (counts as tr, ch 1 here and throughout), [tr in ring, ch 1] 19 times; join with slip st in 4th ch of beginning ch. Round 2: Ch 1, sc in same st as join, [ch 3, sc in next tr] 19 times, ch 3; join with slip st in first sc. Round 3: (Slip st, ch 5, tr, ch 1, tr, ch 1, tr) in first ch-3 sp, ch 1, *[dc in next ch-3 sp, ch 1] 4 times, (tr, ch 1, tr, ch 1, tr, ch 1, tr) in next ch-3 sp, ch 1; repeat from * 2 more times, [dc in next ch-3 sp, ch 1] 4 times; join with slip st in 4th ch of beginning ch. Round 4 (joining round): Slip st in first ch-1 sp and next tr; (slip st, ch 1, sc, ch 3 or square-join, sc) in next ch-1 sp (corner made), ch 3 or square-join, sk next ch-1 sp, [sc in next ch-1 sp, ch 3 or square-join] 5 times, *sk next ch-1 sp, (sc, ch 3 or square-join, sc) in next ch-1 sp (corner made), ch 3 or square-join, sk next ch-1 sp, [sc in next ch-1 sp, ch 3 or square-join] 5 times; repeat from * around; join with slip st in first sc. Fasten off. Round 1: Ch 2, beg-Cl in ring, ch 5, [Cl in ring, ch 5] 7 times; join with slip st in top of beginning ch. Round 2: Slip st in first ch-5 sp, ch 9 (counts as tr, ch 5), tr in same ch-5 sp, *(dc, ch 5, dc) in next ch-5 sp, (tr, ch 5, tr) in next ch-5 sp; repeat from * 2 more times, (dc, ch 5, dc) in next ch-5 sp; join with slip st in 4th ch of beginning ch. Round 3: Slip st in first ch-5 sp, ch 3 (counts as dc), (2 dc, ch 3, 3 dc) in same ch-5 sp, *ch 1, 5 dc in next ch-5 sp, ch 1, (3 dc, ch 3, 3 dc) in next ch-5 sp; repeat from * 2 more times, ch 1, 5 dc in next ch-5 sp, ch 1; join with slip st in top of beginning ch. Round 4 (joining round): Ch 1, sc in same st as join, ch 3 or square-join, sk next 2 dc, (sc, ch 3 or square-join, sc) in next ch-3 sp (corner made), ch 3 or square-join, sk next 2 dc, sc in next dc, ch 3 or square-join, [sc in next dc, ch 3 or square-join, sk next dc] twice, sc in next dc, ch 3 or square-join, *sc in next dc, ch 3 or square-join, (sc, ch 3 or square join, sc) in next ch-3 sp (corner made), ch 3 or square-join, sk next 2 dc, sc in next dc, ch 3 or square-join, [sc in next dc, ch 3 or square-join, sk next dc] twice, sc in next dc, ch 3 or square-join; repeat from * around; join with slip st in first sc. Fasten off. Chain 4; join with slip st in first ch to form a ring. Round 1: Ch 1, [sc in ring, ch 5] 4 times; join with slip st in first sc. Round 2: Slip st in first ch-5 sp, ch 1, (sc, hdc, dc, 3 tr, dc, hdc, sc) in each ch-5 sp around; join with slip st in first sc. Round 3: Slip st in next hdc, (slip st, ch 1, sc) in next dc, *ch 3, sk next tr, (sc, ch 3, sc) in next tr, ch 3, sc in next dc, ch 3, sc in next dc; repeat from * 2 more times, ch 3, sk next tr, (sc, ch 3, sc) in next tr, ch 3, sc in next dc, ch 3; join with slip st in first sc. Round 4: Slip st in first ch-3 sp, ch 5 (counts as dc, ch 2), *(dc, ch 3, dc) in next ch-3 sp, ch 2, dc in next ch-3 sp, ch 2, (dc, ch 2, dc) in next ch-3 sp, ch 2, dc in next ch-3 sp, ch 2; repeat from * 2 more times, (dc, ch 3, dc) in next ch-3 sp, ch 2, dc in next ch-3 sp, ch 2, (dc, ch 2, dc) in next ch-3 sp, ch 2; join with slip st in 3rd ch of beginning ch. Round 5 (joining round): (Slip st, ch 1, sc) in first ch-2 sp, ch 3 or square-join, (sc, ch 3 or square-join, sc) in next ch-3 sp (corner made), *[ch 3 or square-join, sc in next ch-2 sp] 5 times, ch 3 or square-join, (sc, ch 3 or square-join, sc) in next ch-3 sp (corner made); repeat from * 2 more times, [ch 3 or square-join, sc in next ch-2 sp] 4 times, ch 3 or square-join; join with slip st in first sc. Fasten off. Round 1: Ch 1, [sc in ring, ch 5] 12 times; join with slip st in first sc. Round 2: Slip st in first ch-5 sp, ch 6 (counts as dc, ch 3 here and throughout), dc in same ch-5 sp, (dc, ch 3, dc) in each ch-5 sp around; join with slip st in 3rd ch of beginning ch. Round 3: (Slip st, ch 6, dc) in first ch-3 sp, *[ch 3, (sc, ch 3, sc) in next ch-3 sp] twice, ch 3, (dc, ch 3, dc) in next ch-3 sp; repeat from * 2 more times, [ch 3, (sc, ch 3, sc) in next ch-3 sp] twice, ch 3; join with slip st in 3rd ch of beginning ch. Round 4 (joining round): (Slip st, ch 1, sc, ch 3 or square-join, sc) in first ch-3 sp (corner made), [ch 3 or square-join, sc in next ch-3 sp] 5 times, ch 3 or square-join, *(sc, ch 3 of square-join, ch 3) in next ch-3 sp (corner made), [ch 3 or square-join, sc in next ch-3 sp] 5 times, ch 3 or square-join; repeat from * around; join with slip st in first sc. Fasten off. Round 1: Ch 3 (counts as first dc here and throughout), work 15 dc in ring; join with slip st in top of beginning ch. Round 2: Ch 3, dc in same st as join, *dc in next dc, 2 dc in next dc; repeat from * 6 more times, dc in next dc; join with slip st in top of beginning ch. Round 3: Ch 5 (counts as tr, ch 1), (tr, ch 1, tr, ch 1, tr) in same st as join, ch 1, *[sk next dc, dc in next dc, ch 1] twice, sk next dc, (tr, ch 1, tr, ch 1, tr, ch 1, tr) in next dc, ch 1; repeat from * 2 more times, [sk next dc, dc in next dc, ch 1] twice; join with slip st in 4th ch of beginning ch. Round 4: Slip st in first ch-1 sp, next tr, and next ch-1 sp, ch 6 (counts as dc, ch 3), dc in same ch-1 sp, *ch 1, sk next tr, dc in next tr, [ch 1, dc in next dc] twice, ch 1, dc in next tr, ch 1, sk next ch-1 sp and next tr, (dc, ch 3, dc) in next ch-1 sp; repeat from * 2 more times, ch 1, sk next tr, dc in next tr, [ch 1, dc in next dc] twice, ch 1, dc in next tr, ch 1; join with slip st in 3rd ch of beginning ch. Round 5 (joining round): (Slip st, ch 1, sc, ch 3 or square-join, sc) in first ch-3 sp (corner made), [ch 3 or square-join, sc in next ch-1 sp] 5 times, ch 3 or square-join, *(sc, ch 3 or square-join, sc) in next ch-3 sp (corner made), [ch 3 or square-join, sc in next ch-1 sp] 5 times, ch 3 or square-join; repeat from * around join with slip st in first sc. Fasten off. Continue making and joining Squares 1–6, arranged as shown in the assembly diagram. With RS facing, join yarn with slip st in any corner ch-3 sp of throw. Round 1: Ch 5 (counts as dc, ch 2), (dc, ch 2, dc, ch 2, dc) in same ch-3 sp, *[(dc, ch 2, dc) in next 6 ch-3 sps, dc in next ch-3 sp (before square-join), ch 2, dc in next ch-3 sp (after square-join)] across to next corner ch-3 sp, **(dc, ch 2, dc, ch 2, dc, ch 2, dc) in corner ch-3 sp; repeat from * around ending last repeat at **; join with slip st in 3rd ch of beginning ch. Round 2: (Slip st, ch 1, sc) in first ch-2 sp, *(dc, ch 3, dc) in next ch-2 sp, sc in next ch-2 sp; repeat from * to last ch-2 sp, (dc, ch 3, dc) in last ch-2 sp; join with slip st in first sc. Round 3: Slip st in each st to first ch-3 sp, (slip st, beg-Cl, ch 5, Cl, ch 5, Cl) in first ch-3 sp, (Cl, ch 5, Cl) in each ch-3 sp around, working (Cl, ch 5, Cl, ch 5, Cl) in each corner ch-3 sp; join with slip st in beg-Cl. Round 4: Slip st in first 2 ch of first ch-5 sp, (slip st, ch 1, sc) in 3rd ch of first ch-5 sp, *ch 7, sc in 3rd ch of next ch-5 sp; repeat from * around, ch 7; join with slip st in first sc. Fasten off. Hi there! It does look like the entire border is worked right side facing! Some folks mentioned in the comments below they had trouble with the border---some of their issues and troubleshooting might also help! Good luck! This throw looks so beautiful and intricate. It would be amazing if you use a different color for each square. I think this would take me awhile to get done, but it would be amazing in my home. This would also be a great housewarming gift for anyone. Thank you for the great pattern! This throw will be so perfect on my king size bed, draped on my king size bedspread which has pale blue, taupe, and a pale aqua color. I can envision cuddling up with this on those days where Mama wants to lay down to recharge her battery. Six different motifs combine to create a work of art! And just 8 balls of yarn to buy! Beautiful! I love that there are different patterns for the squares and that it has such a light and dainty look. 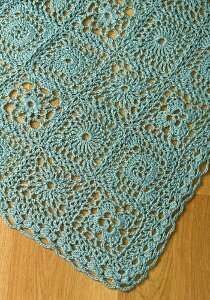 The photo looks so lovely that I am sure that it is going to look wonderfuly elegant and feel so good to wear that I am going to make this Throw to wear as a Shawl or a Wrap, lol! I think throw is 8 squares across by 10 down. Start in top right hand side with square 1 and attach 2 then 3 to the left, then 1,2,3,1,2. So first row, from the right is 21321321, second row, from right is 54654654, repeat rows ending with second row. This is what I can gather from the photos. Can you please upload the assembly chart and add it to your pattern notes? Where is the chart that shows how to arrange the squares? Could you please add it to here? Thanks. The blanket is beautiful! How much yarn does this project require? I am making a wrap that is very similar to this afghan. It is a little difficult at first but the more I worked it the better it got. Make sure your counting is correct so it will stay square on each of the individual squares. It would be easier to piece together individually rather than piecing as you go. This pattern shows 24 oz of yarn used. Caron Spa yarn comes in 3 oz skeins so, you'll need 8 skeins of Caron Spa. If using another yarn, you would need 2,008 yards or 1,840 meters. You may want to buy a little more just in case. You should be able to order this yarn through the caron site. Go to caron.com and look through the yarns. You're not reading the entire pattern and that is causing you problems. I think you are missing the definition of "square-join" under the heading "Stitches Used." Also, if you click on the underlined word Pattern, you will get a diagram of how to arrange the squares. It's beautiful! I love the feel of the Caron Spa. I have been croxheting for 40 years and have no problem reading directions. Then came this pattern. Like many others, I find the instructions for joining impossible to understand. I would really like to do a join as you go so that there is no ridge between the blocks, but at this point in ttime, I'm stymied. One of the comments apparently from the designer indicattes that this pattern was "tech tweaked." Maybe TPTB need to recheck the original against the "tweaked " pattern to see if tthe was an error in transcription. NIGHTMARE INSTRUCTIONS!! Tried doing this one. Caron & their designers as well as their writers should try communicating!! As in the below comment, I am an experienced crocheter. I've won ribbons in fairs with my work as well as teaching & a a former shop owner. Square 1 is definetly a nightmare. Round 2, the way it is written doesn't even connect. I gave this some time & worked it up again - as written = no connection. I even worked it out in crochet shorthand. No go. Now if Caron wants to pay me to write it up as it should be, I might consider it. 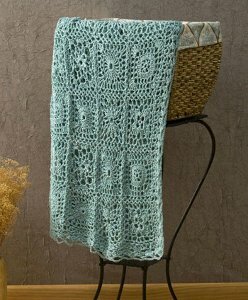 If you like the EFFECT of this afghan, make 5 or 6 grannies you like in the colors of yarn you like & crochet them together. The squares here are 5 1/2". Find your own squares & you'll be a lot happier and save yourself a lot of grief & frustration with the way these directions are written! So much crochet . . . so little time, who needs the agravation. Go on to the next project. Happy Hooking!! @mischief: Thank you for your comment. I'm sure Caron would appreciate that their pattern is causing problems. You can reach them at www.caronyarns.com and request that the pattern be evaluated. Thanks again and good luck! Very pretty pattern. As an experienced crocheter, I suggest the beginners crochet all the squares first, then assemble. It will be more enjoyable & less frustrating. The comment on the schematic is a good one. Caron should have put the yarn requirements in at the beginning of the pattern. It's also better to use the same weight of yarn through any project, especially for the beginner. As you become more experienced, it will be easier to use different weights. Different weights of yarn affect the size of the motif. I myself prefer doing one piece projects, afghans, filet crochet, etc. Do not like the repetitiveness of making the same motif. However, this one is tempting me. Will copy pattern & put on my possibilities list. Wait! Will make it up for my friend who has terminal cancer. She loves green & the one I wanted to do isn't working up as I had hoped. Happy Hooking! I'm starting this today! Suggestion on the yarn amount: Find another afghan pattern you like that is similar only more dense purchase the amount of yarn with similar weight for that one & use if for this one. Plus I always buy about 10% more yarn especially if in dye lots. I have printed this pretty pattern Adante Throw, but am not told how much yarn to buy. The assembly directions are under the highlighted word "Pattern" in the Notes section. Click on the word and it should pull of the assembly schematic. Thanks for helping out our readers, kimberlydadkins 7795057! trying this pattern but little confused on joining round. do i fasten off after the round before the joining round in order to complete the 15 squares? or is the joining done as you go? I did not get the "assembly directions" mention in "notes"
How many skeins of caron joy yarn would be needed to complete this pattern? hello claire, this is how i'd figure the difference as they are different weights of yarn. joy is #4 or worsted weight 138y/2.5oz ball spa is #3 or sports weight 251yd/3oz ball Pattern calls for 24oz of spa so that would be 24oz/3oz= 8 balls. 8balls * 251yrds = 2008 yards of yarn. 2008 yards / 138yds of joy =14.55 balls of Joy I would buy an extra ball or two to be safe. Well, not exactly. This is the pattern after it's been tech edited. It's not my original version. This is a lovely throw,I want to try it. It is a beautiful throw. You should be very proud. to Crafter: I believe if you follow the pattern (click on the link to see the assembly diagram), you'll start by making square #4 then #5 and join it as you go along... Someone correct me if I'm mistaken. This is my first afghan and I'm trying to figure this out at the same time. In reading through the pattern (I have not started it yet)... I believe you start in the bottom left hand corner and working blocks 1 through 6 and then 1 2. Next you move up to the next row starting with block 4. If I am making 15 squares how do I square join in the directions for square 1?